Booking from sunday to sunday. Apartment 2 rooms for 4 people 34 square meters : one bedroom with a double bed, one living room with a pull out bed. Kitchen with oven, micro waves, cookers, fridge, cofee machine, kettle, dish washer ...Batheroom with bath, hair dryer, Toiletts separated, television, radio (with Val d'Isère radio for slopes informations and useful informations). Duvets. All linen included (bed linen, towels, t towels). This residence is ideally situated 300 meters from the turist office in the main street but a little bit up for quiety. Down the residence, you have ski rental shop, supermarket and pizzeria. Bus stop (free buses runing all day and night long) is just at the bottom of the residence. Laisinant chairlift is 400 meters from the building. Parking available for 70€ per week. One bathroom with a bath. Separated toilets. Television, Radio. Equipped kitchen: oven, micro-waves, dish-washer, kettle, coffee machine, toaster. Bed linen, towels and house linen included. Perfect for 3 people. Thoroughly enjoyable holiday. Quiet location. Short walk to the centre. The apartment was clean and comfortable. It is in a great location, nice and quiet, but just a few minutes walk into the centre of the village (or just a short ride on the free bus). 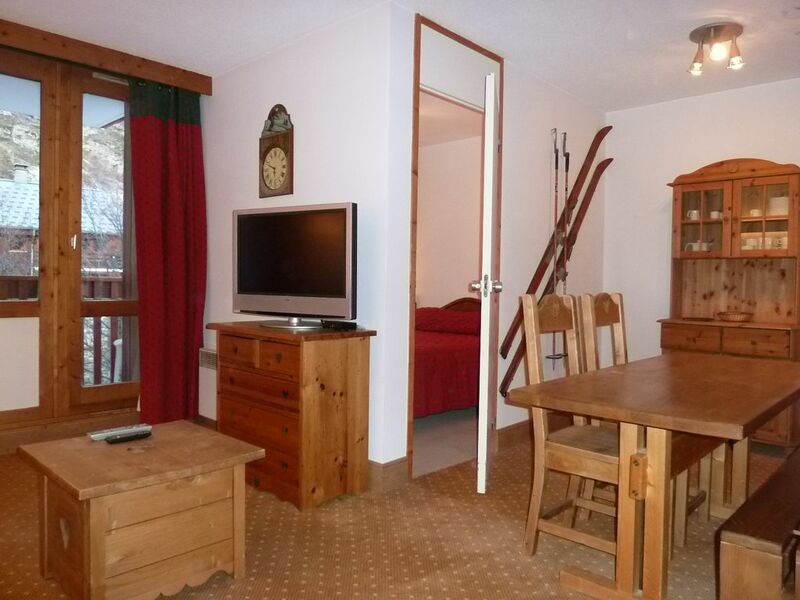 It is right by a ski hire hire shop and Spar supermarket. We did have to collect the keys from a different location about a mile away when we arrived, but our taxi driver was happy to include the extra stop and Marjorie kindly let us check out a little bit later than advertised when we left to fit with our return pick up. We would definitely recommend this and would love to return! It's conveniently located, quiet and comfortable. The full-size bath tub makes it easy to relax after skiing. The grocery store and the bus stop are just a few steps away. Go down Piste L or Germain Mattis, then take your left to the traverse and you will only have to cross the street to get back home. I would only suggest replacing the mattress in the bedroom as it's a bit worn. I will certainly stay here again on my next trip to Val-d'Isere. My husband and I stayed in this lovely apartment for 4 weeks in February 2012. The owners were very helpful and the apartment was warm and cosy, well-equipped, very clean, and with plenty of hot water. There is a lockable ski locker in the basement. Location is a 7-10 minute stroll to the centre, with a good-size Spar supermarket just 1 minute from the front door (great for early morning croissant and baguette dash). The free shuttle bus stop is 50m up the road which we found really convenient. You can ski to the nearest bus stop from a couple of pistes down from the mountain (Mathis (red) and Piste L (blue) - which was even better as we were then only a 2 minute walk back. For one of our weeks a friend stayed - there is another bed under the sofa. Plenty of room in the lounge and round the dining table with 3 of us. In the centre of Val d'Isère. Food shop and ski hire at the bottom of the residence. LOCATION A LA SEMAINE DU DIMANCHE AU DIMANCHE Arrhes : 25 % au moment de la réservation. Solde à la remise des clés. Caution : 300 euros restituée au moment du départ. Ménage : 40 euros Animaux admis : 35 euros par semaine Location du dimanche à partir de 17 heures au dimanche suivant pour 10 heures au plus tard.